Abstract: GeIL incorporated advanced WLCSP (wafer level chip scale package) technology into the Golden Dragon memory line. Style is playing a larger and larger role these days in the design of computer hardware, and for good reason. Why have a bland beige box sit next to you when you can have a "flashy" black or brushed aluminum case with iridescent blue lights glowing inside? I know a few novice computer users who are buying systems that have case windows, and LED fans which until recently were strictly the domain of the "computer geek". I know it's true, because I'm a geek too. Memory manufacturers can realistically only so much to flash up their modules, and the most popular method is simply to wrap the DIMM's with various colours of aluminum or even copper heatspreaders. GeIL, a company that has some of the flashier DIMM's out there, just released their Golden Dragon line of memory - possibly the best looking DIMMs on the market some might say? GeIL incorporated advanced WLCSP (wafer level chip scale package) technology into the Golden Dragon memory line, and aside from the functional reasons to go in this direction, it does look rather cool. To protect the naked silicon DRAMs from damage, the manufacturer added a transparent plastic cover over top. Doesn't that look cool? The eye of dragon glows red thanks to a small LED when the system is on. Very cool indeed, case modders out there should like that! 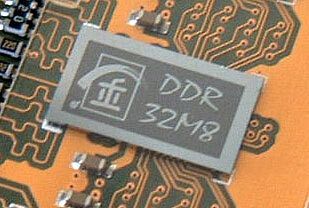 There are no speed markings on the DRAMs themselves, however GeIL has said that they're using hand picked 4ns modules. The Ultra PC3500 Golden Dragon DC memory is rated to run at 433 MHz with memory timings of 2-3-3-6, and is rated to run at between 2.5-3.1V. According to Maxim Integrated Products, "Wafer-Level Chip-Scale Package (WLCSP) is a type of chip scale package which enables the integrated circuit to be attached to the printed-circuit board face-down, with the chip's pads connecting to the PC board's pads through individual solder balls without needing any under fill material. This technology differs from other ball-grid array, leaded, and laminate based chip scale packages because there are no bond wires or interposer connections. The principle advantage of the WLCSP is that the IC-to-PC board inductance is minimized. Secondary benefits are reduction in package size and manufacturing cycle time and enhanced thermal conduction characteristics." 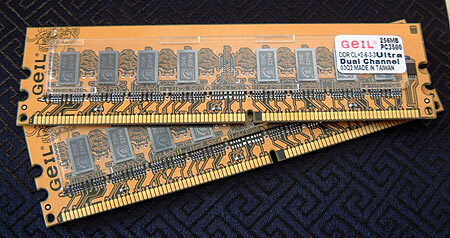 Next, we examine the overclocking potential of these advanced little DIMMs.